Masselink Brothers / Van's Interstate Service has openings in our Inter-modal container fleet to run MI, IN and IL. Paid % of gross. Requires good driving record CDL-A with Hazmat. 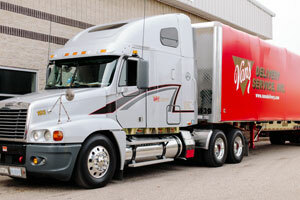 Are you looking to further your career in truck driving, have a CDL and want to work for a company that cares? Van's Delivery Service, Inc. has been in business since 1925. We have stood the test of time and now are stronger than ever. Work for Van's to experience job security with an established West Michigan company. We realize the importance of family life and will do our best to have you home most weekends. We are proud to employ drivers who have worked with us for over 30 years. Be part of a team that is in it for the long haul. We have our own on-site mechanics for vehicle maintenance. We understand the importance of equipment safety so you can be rest assured that our equipment is maintained to high standards. We take safety very seriously, and have been awarded a Fleet Safety Award from the Michigan Trucking Association 4 years in a row. Saving you time and energy so you can focus on the trip at hand. You can be a part of something bigger! We believe in giving back to our community, and are involved with many local charities including Elves and More West Michigan. Competitive compensation packages including hourly and percentage pay. Family is an integral part of Van's business philosophy, so we realize that enjoying time off makes for a happier and more productive employee. Multiple bonus programs are available for maintaining a safe driving record. APPLY FOR A TRUCK DRIVER JOB TODAY! Fill in the form below or complete a full application TODAY! Call Leslie Comstock at (616)514-3843 with questions. WANTED...Truck drivers in Michigan! Truck Driver Jobs Grand Rapids, West Michigan! If you are currently a driver for Van's and would like to know more about our Driver Referral Bonus Program, click here.